The tables that will be copied from the source database to the destination one are: Department, Employee, EmployeeDepartmentHistory and EmployeePayHistory under the HumanResources schema. In order to copy our tables from the AdventureWorks2018 database to the SQLShackDemo one, we can use the Select into SQL statement. This statement will create the tables in the destination database first, then it will copy the data to these tables. If you manage to copy the database objects such as the indexes and constraints, you need to generate script for it individually, after that you need to apply the scripts to the destination database. If any of the tables contains an Identity column, the new column in the destination table will inherit the Identity property without the need to turn on the Identity_Insert. This is valid in most cases unless the Select statement contains Join, you are using Union to join multiple Select statements, the Identity column is mentioned many times in your select statement or the source of this Identity column is a remote data source. If any one of these conditions mentioned is true, the column will be created with Not null property instead of inheriting the required Identity property. To overcome this Identity issue, you can use the Identity SQL function in the select statement to create the Identity column. This method is a quick way to copy tables from the source database to the destination one if you arrange to copy the tables with no concern with the tables’ relationships and orders. Using this method, the tables’ Indexes and keys will not be transferred. If you are interested in copying it, you need to generate scripts for these database objects. If these are Foreign keys connecting these tables together, you need to export the data in the correct order, otherwise the export wizard will fail. SQL Server provides another way to generate script for the SQL Server databases with its objects and data. This script can be used to copy the tables’ schema and data from the source database to the destination one in our case. You can decide from here if you want to script the indexes and keys in your tables. SQL Scripting method is useful to generate one single script for the tables’ schema and data, including the indexes and keys. But again, this method doesn’t generate the tables’ creation script in the correct order if there are relations between the tables. ApexSQL Diff is a useful SQL tool that can be used to find the differences between the databases from schema side and generate synchronization script to create these tables in the destination database in the correct order. ApexSQL Data Diff also is another SQL tool that can be used to find the differences between the databases from data side and generate synchronization script to insert the data in the destination database tables, taking into consideration the Identity columns. From the Data sources tab of the New project window, specify the source server name, the source database name and the Authentication method used to connect to the source server. You need to specify a valid user name and password if you choose SQL Server authentication. Also specify the destination server name, the destination database name and the Authentication method used to connect to the destination server. You need to specify a valid user name and password if you choose SQL Server authentication. In our example, we are interested in the objects that exist in the AdventureWorks2018 database and not exist in the SQLShackDemo database, where we can find the tables to be copied. The main application window will be shown, that contains the data differences between the tables in the source and destination databases in addition to the identical and incomparable data. Here we are interested in the data differences between the tables in the source and destination databases, as in the previous steps we created these tables schema, but they are still empty. The combination of the ApexSQL Diff and ApexSQL Data Diff tools are useful to copy SQL database tables by generating complete scripts for these tables’ schema with indexes and keys and in the correct order, and the tables’ data handling the Identity column insert. 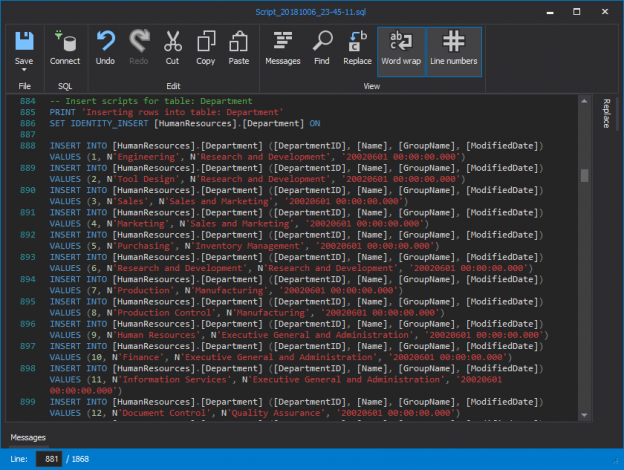 Another useful tool provided by ApexSQL that can be used to copy SQL Server tables data and schema from the source database to the destination one is the ApexSQL Script tool. This nice tool will create script for the database tables schema and data with the indexes and keys of these tables handling the Identity column insert. You need to specify a valid user name and password if you choose SQL Server authentication. ApexSQL Script is a very useful tool that can be used to copy SQL Server database tables from the source database to the destination one without any effort from your side to handle the tables’ creation order. Also, no action required from your side to handle the Identity insert. As you can see, multiple methods can be used to copy tables from the source database to the destination one, including schema and data. Most of these tools require a big effort from your side to copy the tables’ objects such as indexes and keys. Also, these tools will not handle the creation order for these tables if there are relations between it. From the data side, most of these tools need extra steps from your side to handle the Identity insert. Using the combination of the ApexSQL Diff and ApexSQL Data Diff or using ApexSQL Script, by a few numbers of simple steps, you will have a complete script for the database tables’ schema and data with no extra effort from your side to handle anything. Just run these scripts on the destination database and enjoy the result.